My mother was much more comfortable cooking red meat, due to her upbringing in an Eastern Oregon cattle ranching family. Any time we did have fish, it tended to be less than absolutely fresh, requiring lots of what was called "doctoring" to cut through the fishiness. So, needless to say, there's a lot I have to learn about cooking these members of the gill-bearing aquatic family. Gazing distractedly at the fish and seafood case in the store the other day, I noticed a fish with the strange name of "swai," fillets of which were going for less than $4 a pound, a pretty unbelievable price for fresh fish. Pulling out my phone and launching the handy Seafood Watch app, I found out that swai (above left) is a farmed river catfish from Asia—usually Vietnam—with a mild flavor and meaty texture. Rated a "good" choice if it comes from a foreign source, it rates a "best choice" if raised domestically. At that price I couldn't walk away, but what to do with it when I got home? Then I remembered a fish dish my friend Dana had made for dinner the last time we were at her house. 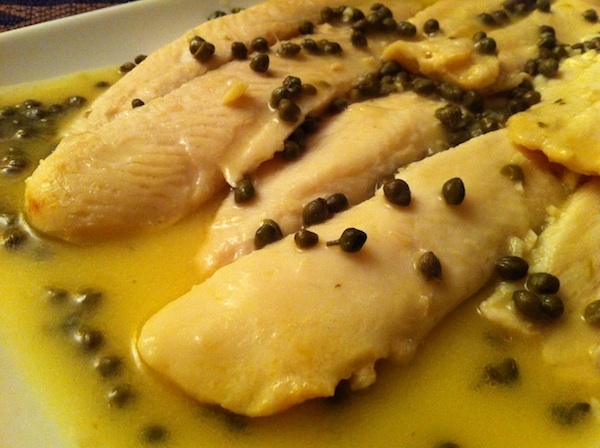 She'd come across a chicken piccata recipe that sounded great, but she had rockfish fillets on the menu. Ignoring tradition like any good creative cook, she not only decided to try a completely new dish on guests, she subbed in the fish for the chicken. Excellent! It seemed like my foreign fish purchase might work as well as rockfish, so I followed her lead. Start to finish, it's ready in about half an hour…and I think you'll agree it's a winner. In a medium saucepan, heat oil and butter over medium heat. Add garlic and very briefly sauté until it's just warmed. Add lemon juice and chicken stock and heat until it barely comes to a boil. 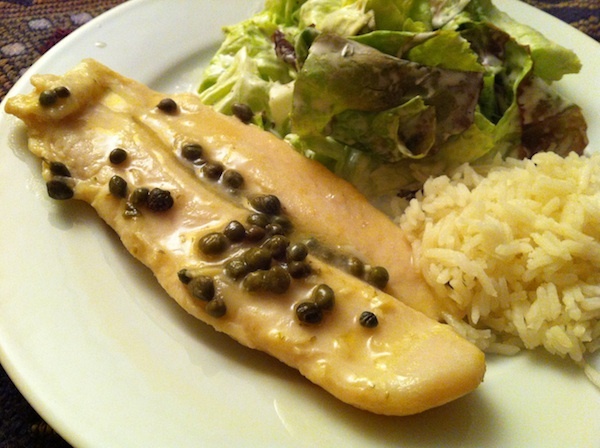 Reduce heat to low, add capers and stir. Add small amount of water to cornstarch to make a thin paste. Add cornstarch to sauce and allow to thicken slightly. Place fish fillets in a 9" by 12" baking pan. Pour sauce over the top and put in oven for 20-25 minutes until fish is cooked through. Thanks, Bonnie. Keep me posted on your experiments…sounds awesome! Frankly, I thought swai was one of the most disgusting food purchases I ever made. 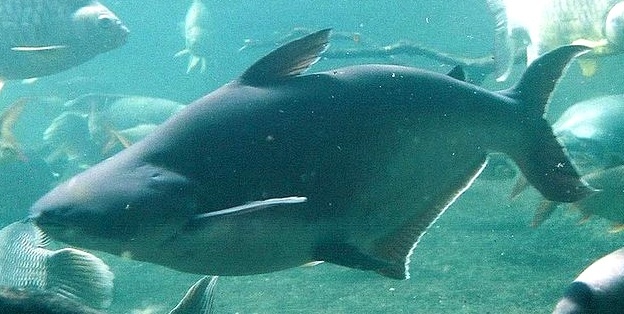 This is a trash fish. You can gussy it up with sauces, but consider how it is raised, and what it is by nature: a bottom feeder. What does it feed on? Would you eat the same? Frankly, I still can't get the bed taste of it out of my mouth. Your comment points out that it's important to know where the fish is sourced. As well as the fact that these days, many species that were considered "trash" are becoming important sources of sustainably raised protein. "Bottom feeder" is a pretty loaded term, and one that describes all kinds of fish that live on or near the sea floor. These can include shellfish, crabs, halibut, flounder, plaice, sole, eels, cod, haddock, bass, grouper, carp, bream, snapper and some species of catfish and shark. Most of which I wouldn't kick off my plate!